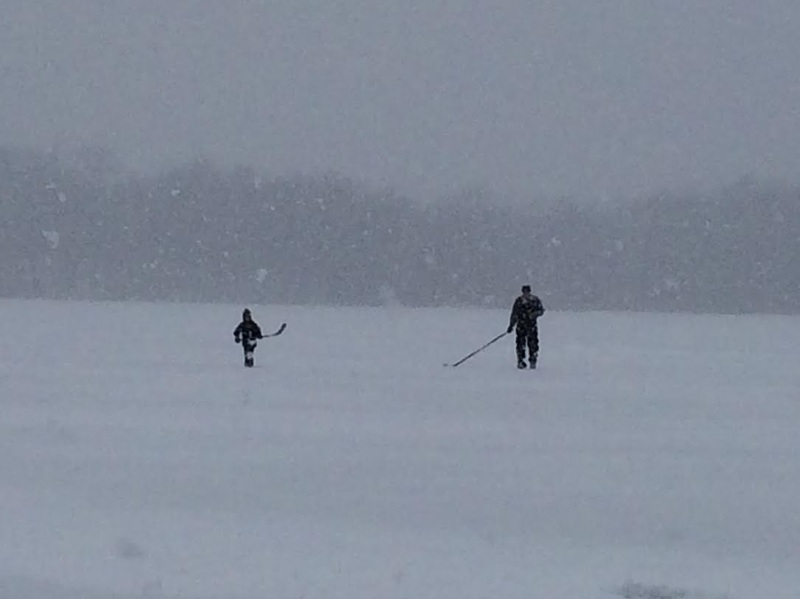 Happy hockey day in Minnesota is probably becoming one of my favorite days of the entire year. As a resident of Minnesota my entire life, you have to find things in the winter to keep you occupied, otherwise "cabin fever" will set in! Not only are the U.S. Pond Hockey Championships going on this weekend at Lake Nokomis, but there will be several televised hockey games from high school to collegiate to the pros! I will likely be spending the first half of Saturday on the counch watching the high school hockey games that will be played at the St. Paul Holman Field airport before heading to the Gopher game at the Mariucci Arena. Hockey Day in Minnesota will conclude with the MN Wild taking on the Phoenix Coyotes at 8pm! WOW... What a day! Enjoy! Yesterday NOAA and NASA reported that 2014 temperatures (land and ocean) were the warmest, globally, since records began in 1880. 15 of the last 17 years have been the warmest ever recorded. There will still be cold fronts but temperatures continue to rise. Who cares? Anyone living near rising sea levels - and the rest of us who like to eat. 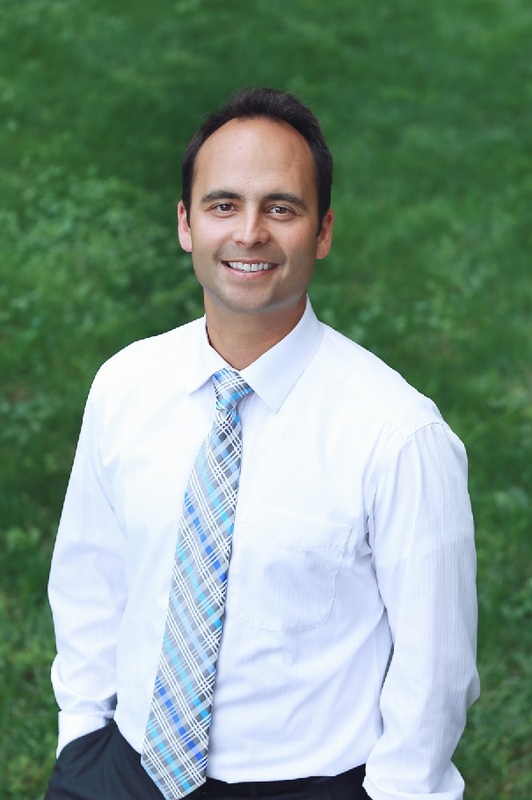 A warmer, wetter atmosphere is resulting in climate volatility, more wild weather swings between drought and flood, putting more pressure on agriculture and fresh water supplies. 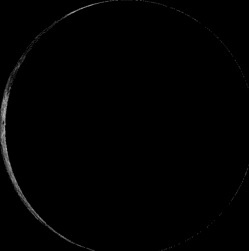 A "natural cycle?" Climate Central places the odds at 1 in 27 million. This should put an end to crazy Uncle Earl ranting about conspiracy theories, temperature pauses and "no-warming-since-1998!". But it won't. Because there's trillions of dollars of coal, oil & gas left in the ground. There's just too much money at stake - and confusion is good for business. Today's thaw will feel like a cheap vacation; temperatures trending above average into next week. A mix is possible today; nothing resembling a real storm. Colder air is brewing for the last few days of January, possibly another brief brush with zero. Is the worst behind us? I think so. Light a candle. THURSDAY: Shades of gray. Seasonably cool. Wake-up: 17. High: 28. FRIDAY: Another gusty clipper, flurries. Wake-up: 18. High: 19. 1996: Severe ice storm over the western and northern Twin Cities with accumulations to 1 inch. A foot of snow fell over central Minnesota. 1982: The citizens of Tower woke up to -52 degrees F.
Enjoy the mild ride while you can! In what is (climatologically-speaking) the coldest time of the year, we will be dealing with temperatures nearly 5°-15° above average through the weekend! A fast moving clipper system will be moving through the Upper Midwest/Great Lakes Region on Saturday allowing temperatures to warm out ahead of it, but temperatures will cool a bit on Sunday as the system slides southeast. The good news is that we won't be tugging down any extremely cold air anytime soon. Readings will stay at or above the average mark through much of next week! 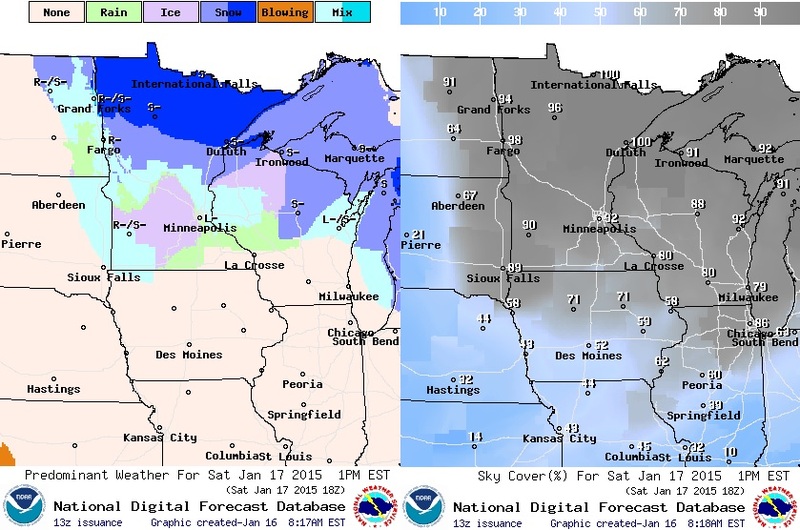 Saturday looks like a fairly mild day across much of the Upper Midwest. Note that temperatures across central and southern Minnesota could settle in close to 40° ahead of our clipper system that will move through during the day. Winds will pick up late in the day after the cold front passes. 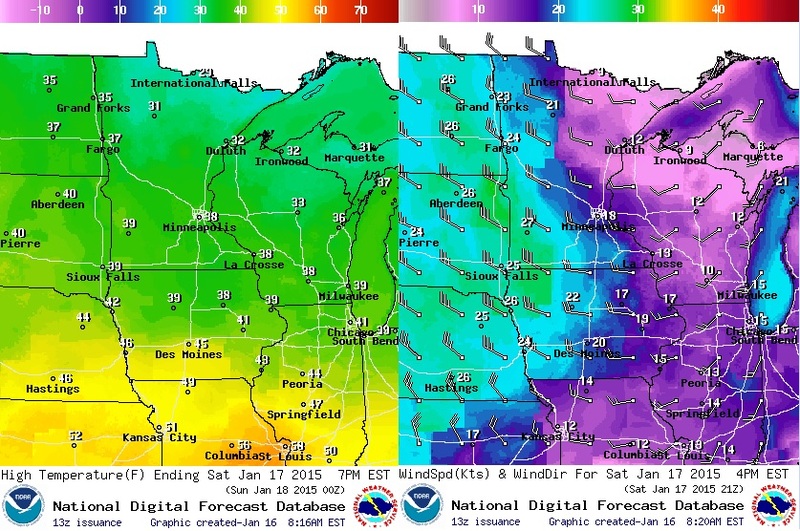 Wind speeds could approach 30mph in the rural areas of far western Minnesota. 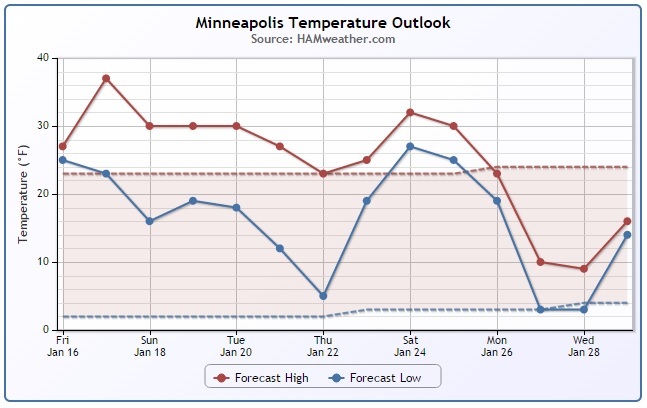 Temperatures on Sunday look to cool a bit, but it won't be too dramatic. As the clipper system races through the Upper Midwest/Great Lakes Region this weekend, a light wintry mix can't be ruled out where temperatures will be flirting with the freezing mark. It appears that central Minnesota and northwestern Wisconsin have the best chance of some patching freezing drizzle and a light wintry mix on Saturday, which folks in far northern Minnesota have the best chance for snow and light accumulations. Accumulating snow looks possible through the weekend/early next week across the far northern part of the state. Some folks along the international border could actually see some shovelable stuff with amounts approaching 2" to 4". Active weather conditions in the Pacific Norwest is the culprit behind our wintry mess as we head into the weekend. Note the heavy moisture moving into the Pacific Northwest as impulses of energy push into the region. One of these storm systems will meander over the Rockies (lose some of it's moisture) and head in our direction this weekend. Because temperatures will be so warm, a wintry mix will be possible across parts of Minnesota and Wisconsin. The farther north you go, the colder it will be, so snow will be the main precipitation type. Some shovelable snow looks likely for some along the international border through Saturday. 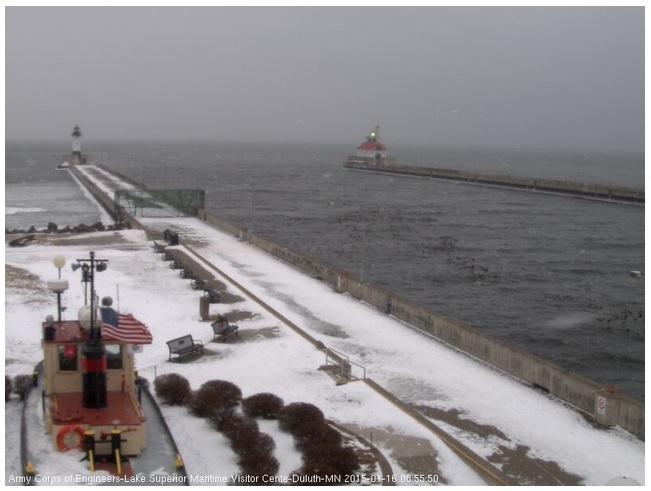 This was the view from Duluth, MN on Friday morning as a little light lake effect snow was falling. With a light easterly wind cold air temperatures, moisture was being picked up off Lake Superior and deposited near the head of the lake. 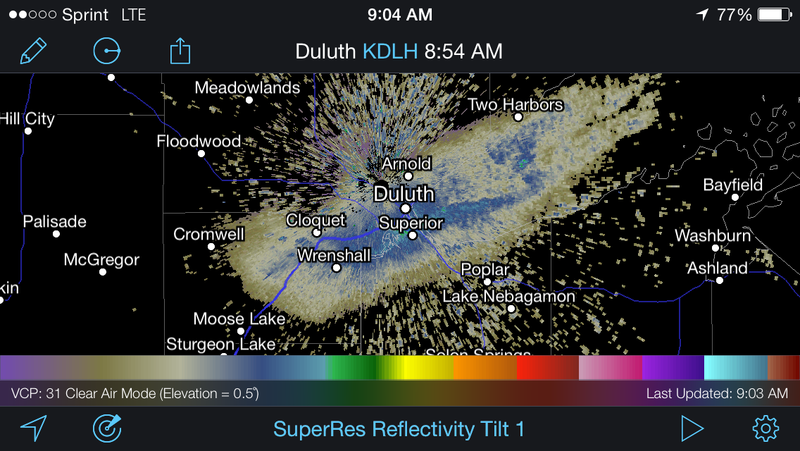 This is what the radar picture looked like near Duluth, MN on AM Friday as a little light lake effect snow was falling near the Head of the Lake. The simulated radar reflectivity loop below shows our clipper system moving through the Upper Midwest on Saturday with a wintry mix and some light snow accumulations across the international border. The other two areas of interest will be the heavy moisture moving into the Pacific Northwest over the weekend and the moisture developing in the Northeast. Take a look at this interesting feature below... note the plume of moisture stretching from just west of the Hawaiian Islands to the Pacific Northwest. This feature is known as an "atmospheric river", which tends to be a big moisture producer for folks along the West Coast. This time it appears the heavy moisture will be setting up shop for folks in the Northwest with precipitation amounts approaching 3" to 6" or more through early next week! According to NOAA's HPC, the 3 day precipitation forecast suggests a swatch of moisture along the northern tier of the nation as our weekend clipper scoots across the international border. Note the heavy moisture developing in the Pacific Northwest with as much as 3" to 6" + of liquid accumulating through early Monday! There also appears to be a decent swath of moisture lifting north along the Eastern Seaboard through late weekend/early next week. Keep in mind that temperatures here may be cold enough for some snow! According to the U.S. Drought Monitor, there is still quite a large area in the western U.S. with EXTREME to EXCEPTIONAL Drought conditions, which includes much of California. Interestingly, much of Minnesota is considered to be abnormally dry, including the Twin Cities. 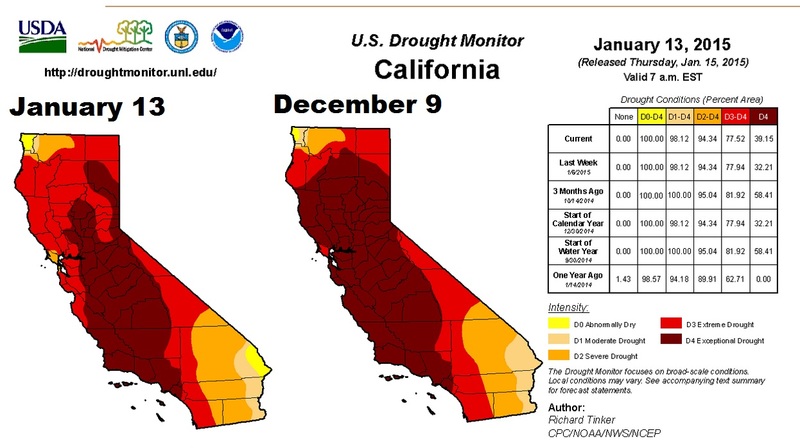 California is still under a pretty big drought! 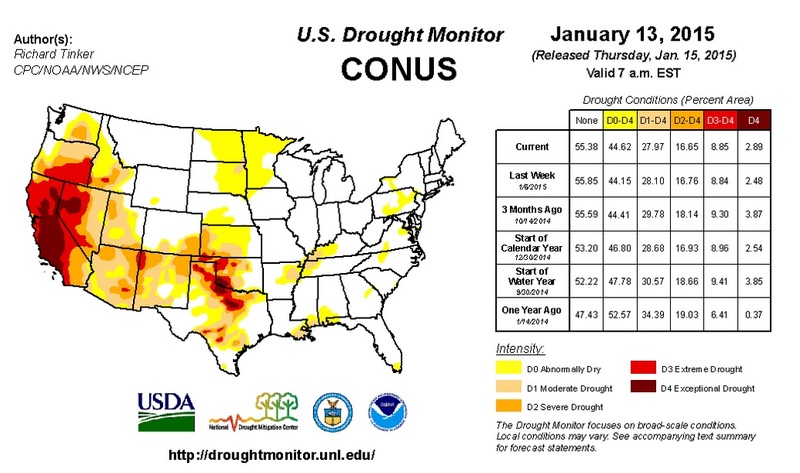 In fact, as of this week, the U.S. Drought Monitor suggested that nearly 40% of the state is under an EXTREME Drought! However, it's better than about a month ago (December 9th) when nearly 55% of the state was under an extreme drought. 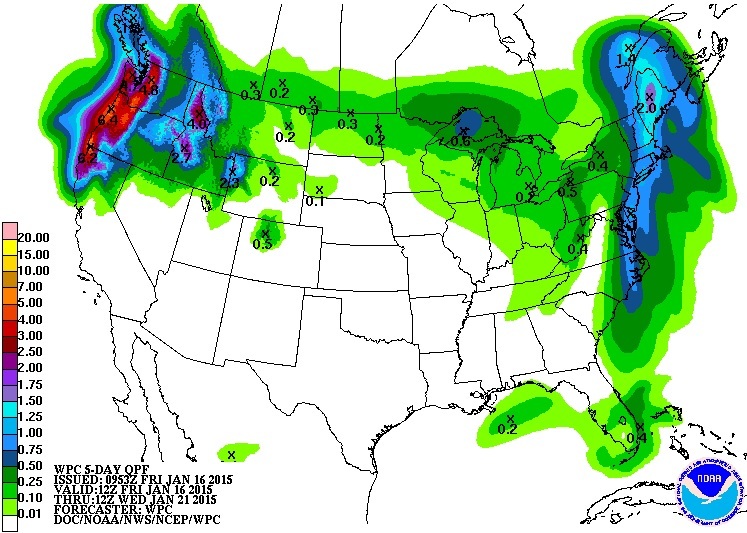 Hopefully we'll continue to see moisture in the western U.S. and Calfornia! 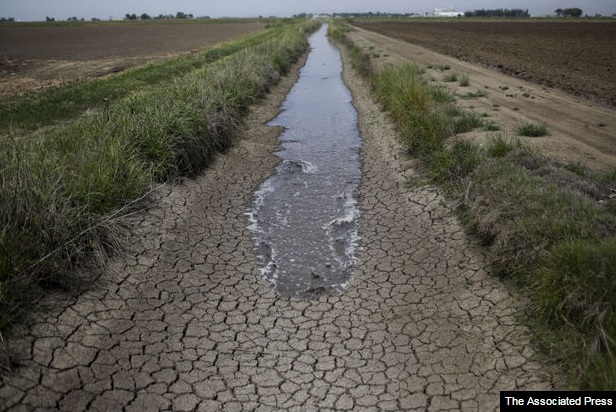 Officials: California Headed into 4th Drought Year"
Still crossing your fingers for miracle storms to bail California out of the driest three-year stretch in the state’s recorded history? Well, the latest news from the Climate Prediction Center isn't what we'd like to hear, but their latest forecast suggests drought conditions continuing into April! 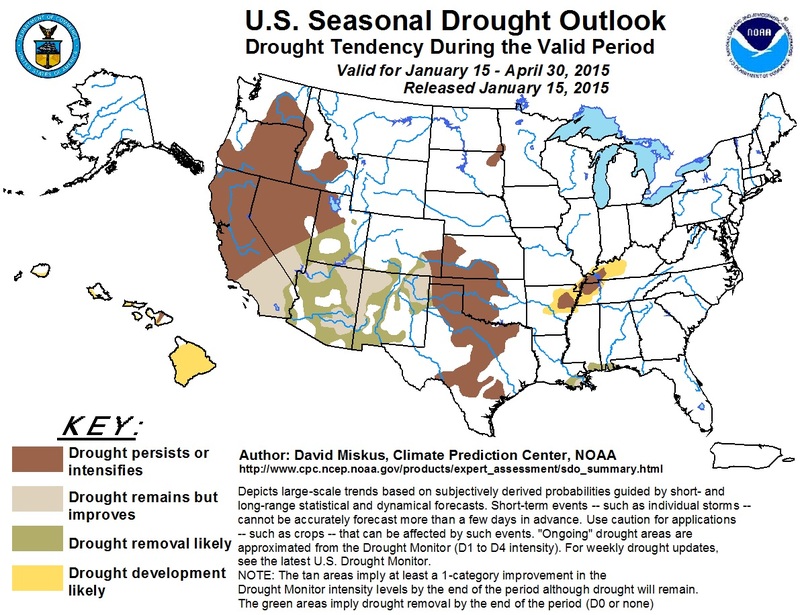 "The drought outlook valid from January 15 through April 30 is based primarily on initial conditions, the February and February-April precipitation outlooks, El Niño precipitation composites (a weak episode is possible this winter), and climatology. In California, the wet climatology for February and March (especially in the south) and a tilt of the odds toward above-normal precipitation in the monthly and seasonal outlooks across the southern half of the state should bring improvement there, but it must be emphasized that improvement is not elimination, and that most of the state will still be in drought to some degree by the end of April." Just as we seem to be settling into our nice mild weather trend, it appears that some cooler air may be working back into the Lower 48 by the end of the month. 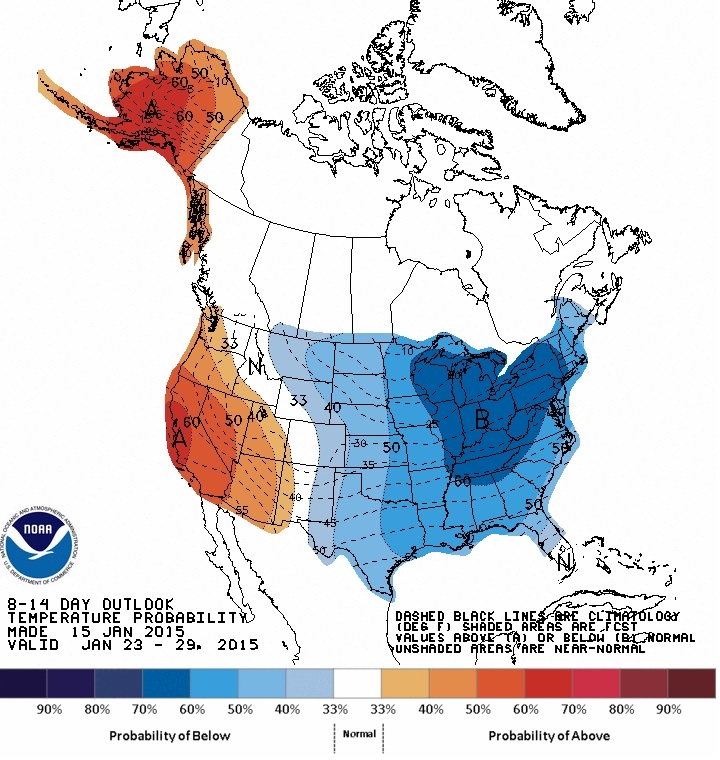 According to NOAA's CPC, the 8 to 14 day temperature outlook (January 23-29) shows a fairly good chance of below normal temperatures across the eastern two-thirds of the nation. Mild Weather Through the Weekend!